Pirates is a fun and funky, cartoonish slot game from Novomatic. This slot can be compared to an animated movie about Long John Silver! Legends of pirates are popular for all ages. Famous books and films, such as Treasure Island, Peter Pan and Pirates of the Caribbean, have lit up imaginations all over the world. Pirates are magical for people of any age. If you dream, or you’ve ever dreamed of being a pirate, you should play this slot game. As you spin the five reels, you can imagine yourself living on a pirate ship and going on a hunt for buried treasure. The treasure chest filled with golden coins is just a taste of what you can win in this slot game. The pirate ship in this slot game has wind in its sails as it journeys across the seven seas in search of Free Spins and big wins. You’ll find parrots, pirate flags and palm trees in this game. 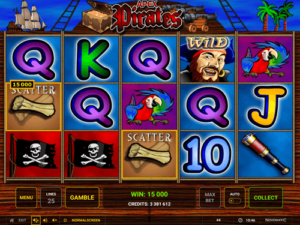 Pirates is a slot game with 25 paylines. The paylines aren’t fixed and you must play with all of the lines active. At the bottom of the reels, you can set your bet per spin to a value you’re comfortable with. Remember, when you are playing for real money, it’s always important to game responsibly. To play Pirates for real money, visit a Novomatic casino and create an account. Not sure which Novomatic casinos are the best? We’ve got you covered. Check out our reviews for information on each casino, where they’re licensed and the sort of bonuses, they offer their players. Pretty Polly Parrot might be pretty but she’s also the symbol that gives the smallest wins. Her beautiful red, green and blue feathers can pay 2x match wins as well as 3x match wins, 4x match wins and 5x match wins. The same goes for the pirate’s pistol and the pirate’s monocular. The Scatter symbol, which is the treasure map, can also pay out wins for matches of 2 or more. The other symbols require at least 3x matches before they award a payout. These symbols are: 10, Jack, Queen, King, Ace, the pirate’s compass, the pirate’s flat, the pirate ship and the pirate himself! The pirate in this Pirates slot game could definitely do with a shave. He’s not wearing an eye patch but he does have a pirate’s hat and a gold hoop earring. The pirate is wild by nature and wild by name. Other than the Scatter, he is cheeky enough to substitute for all symbols if he can complete a win from his position. When the pirate makes a substitution and completes a winning combination, he does something very special. Not only can he help you get wins that you’ve narrowly missed, but he also doubles the size of any win he helps you get! See, pirates aren’t all that bad! Their reputation isn’t always worth listening to. Aye, me hearties! When you open the paytable of this fantastic Novomatic casino slot, you can see the choppy sea! Floating in the sea are three rum barrels, but these aren’t symbols in the game. There are other piratastic games from Novomatic, which we’re sure you’ll love! It’s time for you to go and try: Sharky, Age of Privateers, Captain Venture and Red Lady. The only way for pirates to find treasure is with a treasure map! The Scatter symbol is a treasure map on a scroll. 2 or more Scatters give a win but 3 or more Scatter symbols start the bonus feature! When you win the bonus, you’ll be shown the treasure map, which will fill the whole screen. Everyone knows that the ‘X’ marks the spot. You get 5 Free Spins automatically for the bonus, but depending on which Xs you choose on the map, you can get many more Free Spins and win multipliers, too! If the X uncovers a pirate symbol, the win multiplier will be increased! If the X shows a treasure chest, you can get more Free Spins. The treasure chest can give you an extra 3 spins, 5 spins or 7 spins. If you choose an X that uncovers the pirate’s flag symbol, you will no longer be able to choose more Xs and the Free Spins will begin. All wins in the Free Spins will be multiplied by the win multiplier you won during the treasure hunt!